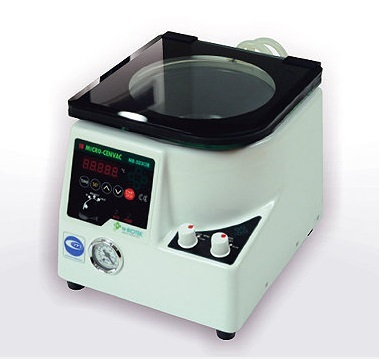 The Micro-CenVac is a compact size centrifugal vacuum evaporation and concentration system with IR heating designed to concentrate DNA or RNA. An infra-red emitting glass lid insures uniform and rapid concentration of samples via heat transfer under vacuum conditions.. Ideal for molecular biology, proteomics, genomics, genetics, cell biology and drug discovery laboratories.